The flexibility of the cervical spine which supports the full weight of the head, about 12 pounds, makes the neck very susceptible to pain and injury, according to the American Chiropractic Association. �For neck pain that isn�t caused by serious conditions like osteoarthritis in the neck, nerve compression like herniated disks or diseases like cancer and meningitis, everyone should feel empowered to ease their pain with self-massage,� says Ayurvedic Expert and Shankara Spokesperson Judith Bourgeois. Many people suffer daily with muscle strains, worn joints, shooting pain in the shoulder or down the arm, numbness or loss of strength in arms or hands. To revitalize and balance the body and relieve pain caused by strained muscles, injuries, improper or heavy lifting and sudden awkward movements, Ayurveda offers a holistic health approach---self massage. Shankara products are rooted in Ayurveda, a 5,000-year-old Indian tradition and philosophy based on knowledge of the youth-restoring effects and therapeutic uses of herbs and oils to bring balance to the body, mind and spirit. 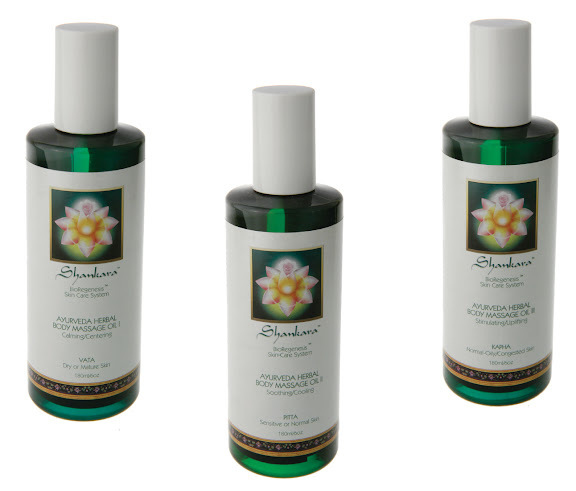 Each Shankara Ayurvedic Massage Oil is formulated with a highly therapeutic herbal oil blend made from pure, natural oils and herbs selected from the East and West. A powerful synergistic blend of essential oils is incorporated to support physical, emotional and mental balance. To maximize the potency of the massage oils, herbs are placed in the oil mixture and are slowly simmered for a few days, over a low heat. This process gently extracts the healing properties of the herbs and infuses them directly into the oil mixture. Then the appropriate blend of essential oils for each formula is added. Because each oil is cold processed, they are able to preserve their vitality, resulting in extremely effective Ayurvedic massage oils. Ayurvedic Body Massage Oil III (Kapha) � grapeseed oil, hazelnut oil and other active ingredients stimulate circulation and energizes and uplifts the senses, effective when feeling lethargic or tired. Additional Ayurvedic body massage oils offered by Shankara include: Lymph-Detox, Cellulite Support, Anti-Inflammatory, Female Rescue and Manjista Foot Oils. Retail prices range from $20 to $53. Body Massage Oils I, II and III will be discounted from $42 to $35 until October 15. For more information, visit www.shankara.com. Dear EarthTalk: What would it take to produce �green� tires? The tire industry is huge and I understand that tires contain a large amount of petroleum products. Is there an alternative? Tires are indeed no friends to the environment. Most tires on the road today are constructed of roughly equal parts natural rubber, petroleum and �carbon black� filler (derived partially from burned fossil fuels), along with a dash of other chemical additives to improve functionality. 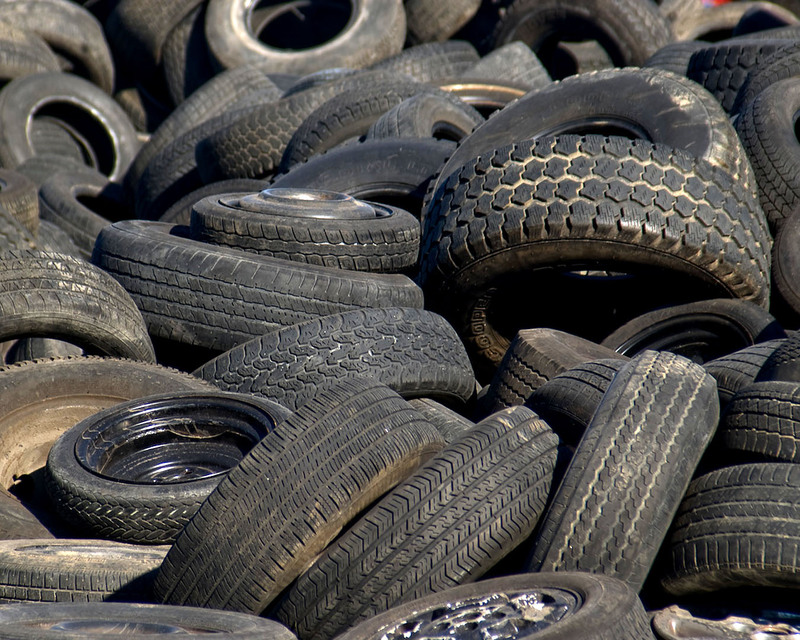 The tire industry has embraced recycling in recent years, but still some 25 percent of tires wind up in landfills, according to Michael Bloch of the GreenLivingTips.com website. Still others are incinerated, which releases benzene, lead, butadiene, styrene and other potential carcinogens into the air we breathe. Even worse, Bloch reports, nearly half of the spent tires in the U.S. are used as �Tire Derived Fuel� (TDF) and burned alongside other dirty polluting fuels such as coal. According to the Rubber Manufacturer�s Association, old tires fuel cement kilns, pulp and paper mills and industrial boilers, and are used as well by electric utilities and some dedicated tires-to-energy facilities. Beyond the actual ingredients in tires, environmentalists have also been critical of the tire industry for producing tires that stick to the road so well that they cause engines to burn extra fuel to overcome the added friction, which leads in turn to more greenhouse gas emissions out of our tailpipes. In response to such criticism, tire engineers have begun incorporating a wide range of new materials as substitutes for petroleum and chemical fillers. Today consumers can already buy low rolling resistance tires that generate about five percent less friction than traditional tires. This translates into a four to eight percent boost in fuel economy depending upon the engine, according to Forrest Patterson of Michelin North America. Over a tire�s lifetime, that could save up to 80 gallons of gas, he says. Encouraging motorists to keep their tires inflated to proper levels has also helped reduce tire-related emissions. What�s in these greener tires anyway? Chemically toughened natural rubbers, vegetable-based processing oils, and fibers made of plant cellulose are used to replace some of the petroleum in the newer so-called �low-oil� tires. Meanwhile, environmentally benign silica filler (sand microparticles) has been used to replace some of the carbon black reinforcement, with the added benefit of further reducing road friction. While greener tires are already available, tire makers have been re-doubling efforts to recycle old tires into new ones to further reduce the industry�s environmental impact. Small quantities of reprocessed rubber are showing up increasingly in new tires, but manufacturers would like to see more of the 75 million or so tires Americans send to landfills get reprocessed to live another useful day as new tires or other products. CONTACTS: Green Living Tips, www.greenlivingtips.com; Michelin North America, www.michelin-us.com; Yokohama Tire, www.yokohamatire.com. Here is a healthy salad recipe from Executive Chef Roger Stettler, Ferraro's Bar & Restaurant in Maui. Chef Stettler was a recent participant in Wolfgang Puck and Barbara Lazaroff's American Wine & Food Festival in LA. Vegetable Salad: Mix all the diced vegetables with 1 tbs. olive oil. Cilantro Dressing: Blend all the ingredients with a food processor.